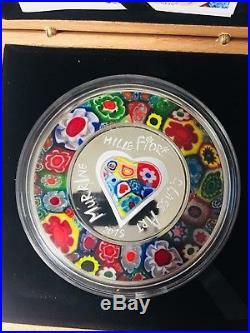 MURRINE MILLEFIORI GLASS ART 1oz Silver Proof Coin $5 Cook Islands 2015 SOLD OUTThis is a brand new MURRINE MILLEFIORI GLASS ART Silver Proof Coin that is absolutely beautiful. 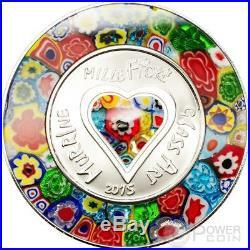 Only 999 of these coins were released and it is super rare. 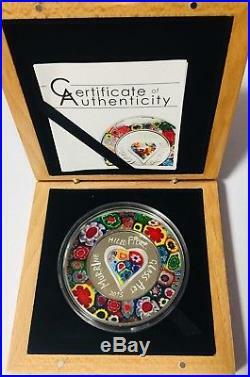 It comes with the original box and coa. First Silver 999 coin issue dedicated to the world’s most popular handwork, the Murrine Millefiori of Murano in Italy. 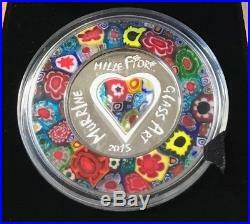 Each coin is unique, the glass rods are handmade, cured and then cut into discs. 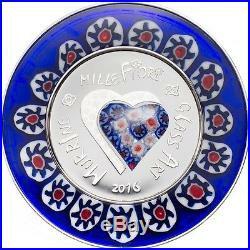 After that the individual multicolored glass discs are placed into a mould, heated gently and slowly melted.